Three persons including a High Chief were have been paraded by the Anambra State government for alleged illegal collections of levies and extortion of money from the people. They are the High Chief, Nze Francis Eze his driver, Mr. Vincent Eze-Obi and Gilbert Ugochukwu. The trio, according to state Commissioner for Trade and Commerce, Hon. Christian Madubuko, who paraded them at the state secretariat, Awka, was arrested in Ekwulobia market, Aguata local government, while allegedly extorting money from market men and women. In a swift reaction, one of the suspects, Eze, said he was never a fraudster as he obtained approval from Aguata local government authority to build a market in Ekwulobia from where he collects rents, an arrangement he said the monarch of the town was aware of. 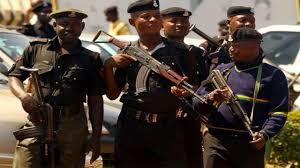 But the Commissioner, Madubuko, lamented that despite government’s consistent warning and ban on collection of all kind of levies, some people were still extorting money from innocent citizens, assuring that he would hand the suspects immediately over to the police for them to be charged to court. Decrying the penchant for flaunting government orders on collections of illegal revenues, the commissioner said: “They are enemies of the state government. The government has banned toll collections and yet they are collecting money from people. They are living on extorting money from people. His ministry he said had successfully prosecuted about 75 illegal revenue collectors in the state, who were now severing various jail terms in prisons, warning that the state government would deal ruthlessly with the accused to sanitize the system. Speaking to newsmen one of the suspects, Eze disclosed that he spent over N8.2 million in the process of building the market where he collects levies from the traders. He said: “I bought a land in the area at the cost of N5.3 million and I have spent over N3 million on the construction of 24 lock-up shops. All the money, we get as toll is plowed back into the building of the shops.